Use only secured and trusted digital wallets to store your bitcoins. Bitcoins, the new generation digital asset that shook the world in late 2017 with its unexpected high value. The cryptocurrency took the world by storm last year when its price peaked to $19,300 from 6 cents back in 2010. Bitcoin has not only drawn the attention of the industry but also noticed by the tech leaders across the globe. Now, business has started including the decentralized system in their structure for a more secure and reliable network. Besides, the cryptocurrency that is backed up by the decentralized approach instead of centralized banks makes it more secured for the people to carry out the transactions. However, the cryptocurrencies also pose a significant risk for the investors as you don't when the price falls to the ground as they skyrocketed. So, if you are an investor and thinking to buy bitcoins, then you should be aware of every aspect of the cryptocurrency. In order to buy, hold and sell these bitcoins or any cryptocurrency you must own a digital wallet. There are a number of wallets available in the market offering excellent service and assured security, However, only some keep their promise intact. 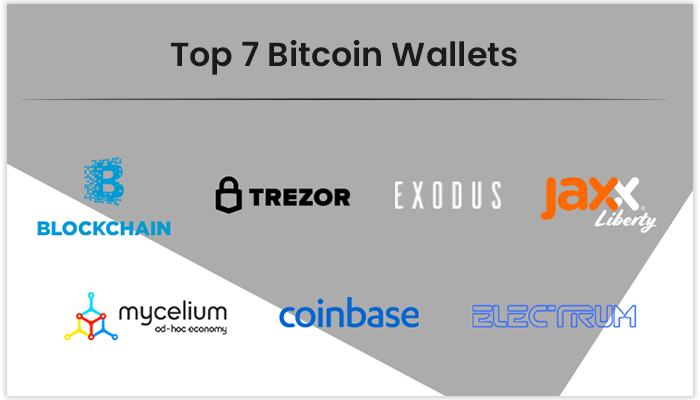 But, don't worry we got it covered, here is the list of top 7 Bitcoin wallets that you can use to start your bitcoin investment. Coinbase occupies the first place in the best bitcoin wallets list as it more preferable and efficient wallet available right now. The user can easily connect the wallet with a U.S bank account and transfer the dollars into it. The bitcoin wallet holder can easily transfer the dollars in it and converts the real dollars into the bitcoins at any time. Coinbase is the perfect choice to buy, hold and sell the bitcoins without any issue. The bitcoin wallet currently supports Bitcoin Cash, Ethereum, and Bitcoin, besides there is news that the wallet could support more cryptocurrencies in the coming time. The user interface of the wallet is intuitive and very easy for the users to get comfortable with it in no time. The prime concern with the digital wallets is the security, where most of the users are afraid of their wallet getting hacked and losing all the bitcoins. However, Coinbase offers the best security against any risk of losing the bitcoins. There are multiple layers of security on the wallet that makes it secured against any hacking attempt. Besides, the wallet gets regular updates and monitoring to keep the security levels high. Trezor is another excellent option when it comes to the security of your valuable bitcoins. However, Trezor isn't a full bitcoin wallet as it doesn't allow selling and buying of the bitcoins. Instead, it is a physical device that is capable of storing your bitcoins by connecting to a computer, mobile or tablet. The device transfers the bitcoins available from other platforms to itself, and you can keep it lock and safe in Trezor. Besides, the device also works as a password manager for the users and comes with two-way factor authentication to protect your assets. However, you won't be able to buy or sell any bitcoin via Trezor. On the bright side, the device can be considered as the best place to keep your bitcoins hidden as it is stored in a physical device that can be reached by hackers via the internet. If you don't trust the physical device much to store your bitcoins then here is software for you. Electrum is bitcoin wallet software instead of a platform which will keep your bitcoins stored in files on your laptop. The bitcoin wallet software comes with all the required functionalities for storing your bitcoins. Electrum is available for Windows, Mac OS X, Linux, and Android and can be installed easily on any of the supported devices. Once you install the software, you can transfer and lock your bitcoins inside the software, and it will keep the coins safe. Electrum holds the upper hand over Trevor as you don't have to carry a specific device for storing your bitcoin, you can leave them in your laptop or desktop. However, Electrum doe comes with a risk, as if your laptop or desktop gets corrupted, damaged or burn in a house fire, you will lose your bitcoins. Although there is a recovery process in the software for that, you have to get a separate handwritten or printed set of keys. Blockchain.info is an online platform that works almost similar to the codebase and helps you to deal with your bitcoins. Why I said almost because this platform works on the core system of the bitcoins that makes it possible for all the cryptocurrencies to exist. You can store all your bitcoins on the platform, but you can't sell and buy them, it won't allow you any exchange process. This is because the platform offers the storage and exchange service in different parts, so to sell and buy your bitcoins you have to access the separate part. As the transaction does not takes place beside the storage; this online bitcoin wallet is more secure than Coinbase. This separation ads an extra layer of security to the storage. However, the separation makes it complicated for the users to sell and buy the stored bitcoins. One of the best bitcoin wallet for the newbies, Mycelium offers a secured platform for storing the bitcoins. It is an open-source platform that is backed up by an active community of developers to keep it updated. The platform is straightforward to use as it comes with very intuitive UI and simple options for anyone to get used to it in no time. The platform is so simple as it doesn't require any username, password, email verification or any onboarding details, go and start using it. With Mycelium you get the full access to your bitcoin private key, and you can import it anytime you want. Besides, the platform offers 12 HD wallet that comes with 12 words seed backup key that you should write down or save somewhere safe. The key will help you in restoring you lost bitcoins in case your device gets damaged or lost. Exodus is another desktop-only best bitcoin wallet that shares the same functionality as Electrum. However, the platform has much more features than Electrum and looks more intuitive than other wallets. Besides, Exodus is also the world’s first multi-cryptocurrency wallet offering the unrivaled security. Unlike, Electrum the Exodus has a unique user interface and it shows the bitcoins in the form of graphs and charts tracking every detail about it. If you are new in the industry, then you will get great help from the insight before jumping into the bitcoin business. The platform is frictionless, doesn't require any verification or username; however, you need to take care of the seed backup key. However, in this software, you can make a copy of the seed only when you have some balance in your bitcoin wallet. The best part of using Exodus is that you get a pie chart at the center of your home screen where you can see all your transaction in a single go. Jaxx is another multi-asset digital wallet that is most commonly used by bitcoin investors across the globe. The platform currently stores both bitcoins and altcoins for the interested investors. Jaxx supports the transactions of total 13 cryptocurrencies that makes its ideal for the investors dealing number cryptocurrencies. Jaxx is backed up by an actively working team of developers enhancing the platform's speed, security every day. Besides, Jaxx comes with no-authentication or verification process like onboarding, email verification or anything. You just need to go and start using the platform for safely storing your bitcoins. Along with this, Jaxx is an HD wallet which means it comes with a seed key for you to restore your assets in case your device gets damaged. Moreover, the platform also comes with Shapeshift.io integration for currency exchange for the investors dealing with multiple cryptocurrencies. Bitcoins could revolutionize the future and will take the world to a future where we have a more impactful system with transparency and uncompromised security. 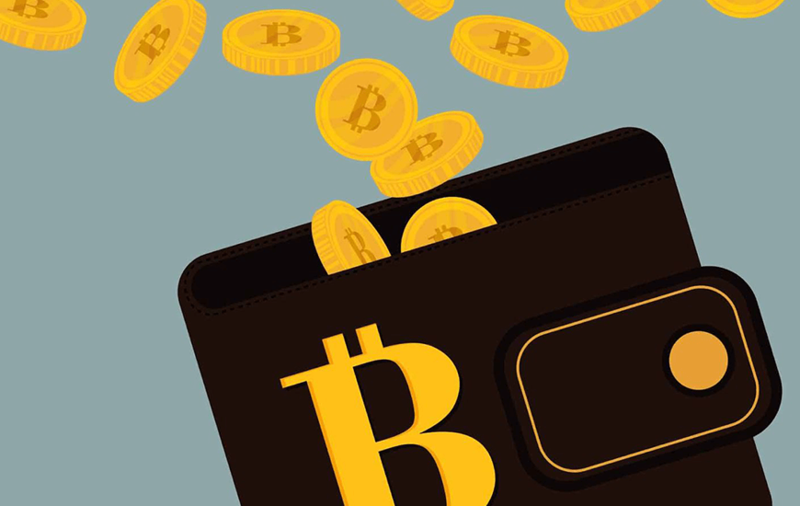 If you are among the bitcoin believer and want to become part of the industry by investing, then you must have one of these above-mentioned bitcoin digital wallets. Above mentioned all the seven bitcoin digital wallets are capable of ensuring the security of your digital assets. PREVIOUS Is WhatsApp Finally Getting The Dark Mode?